Ocean Isle, North Carolina – April 19, 2018 – Pet obesity in the U.S. increased in 2017, affecting 60% of cats and 56% of dogs, according to the Association for Pet Obesity Prevention (APOP). APOP’s tenth annual survey revealed opinions of pet owners and veterinary professionals on several pet food issues such as the benefits of corn, dry versus canned foods, whether or not pet food has improved, and the best sources of pet dietary recommendations. In the October 2017 clinical survey, 56% of dogs and 60% of cats were classified as overweight (body condition score (BCS) 6-7) or obese (BCS 8-9) by their veterinary healthcare professional. These results indicate an estimated 50.2 million dogs and 56.5 million cats are above healthy weight, based on 2017 pet population projections provided by the American Pet Products Association (APPA). In 2016, APOP found 54% of dogs and 59% of cats were overweight or obese in the U.S.
48% of pet owners stated that their veterinarian failed to recommend a maintenance or routine diet for their pet and 15% commented that they “had to ask” to receive a pet food recommendation. 50% of surveyed veterinary professionals replied they offered maintenance pet food recommendations. “People food” for pets was generally considered “unhealthy,” with 65% of pet owners and 67% of veterinary professionals agreeing. Organic pet food was perceived as “healthier” by 39% of pet owners, down from 43% in 2016, while 40% reported “I don’t know.” 26% of veterinary professionals categorized organic pet foods as “healthier,” up from 15% in 2016. 17% of veterinary professionals stated “I don’t know” when it comes to organic pet foods being “healthier” for pets. When asked “Where do you receive the best dietary recommendations for your pet? (check all that apply),” pet owners and veterinary professionals differed in trusted sources. Dry dog food dominated canned or moist with 53% of pet owners and 69% of veterinary professionals feeding dry kibble to their pets. Canned dog food was preferred by 17% of pet owners and 12% of veterinary professionals. Cats were more evenly split in the APOP survey when it comes to feeding dry or canned foods. Dry cat food was fed by 49% of pet owners and 57% of veterinary professionals and canned/moist food by 38% of pet owners and 33% of veterinary professionals. The effect of canned pet food on oral health seemed to cause considerable confusion among both groups. When asked if “feeding a predominantly canned or moist food will damage your pet’s teeth,” 35% of pet owners and 31% of veterinary professionals said “Yes.” 39% of pet owners and 58% of veterinary professionals responded “No,” while “I don’t know” earned 26% of pet owner responses and 11% of veterinary professionals. Raw diets continue to divide these two groups, although support of raw diets among pet owners appears to be diminishing and confusion increasing, at least according to this survey. Pet owners also reported confusion and disagreed with veterinary professionals about low- and no-grain diets and corn. The annual obesity prevalence survey is conducted by APOP. Veterinary practices assessed the body condition scores of every dog and cat patient they saw for a regular wellness exam on a given day during the study period. Body condition scores based on a whole-integer, nine-point scale and actual weight were used in classifying pets as either underweight, thin, ideal, overweight or obese. The 2017 survey included the assessment of 1,610 dogs and 714 cats by 178 veterinary clinics. The online questionnaire was completed by 1,215 pet owners and 544 veterinary professionals from October 11 to December 31, 2017. The Association for Pet Obesity Prevention is a 501(c)(3) nonprofit organization founded in 2005 by Dr. Ernie Ward with the primary mission of documenting pet obesity levels in the United States to raise awareness of the issue and its negative impact on pets. The APOP Board of Directors is made up of veterinary practitioners, nutritionists, surgeons, and internal medicine specialists. 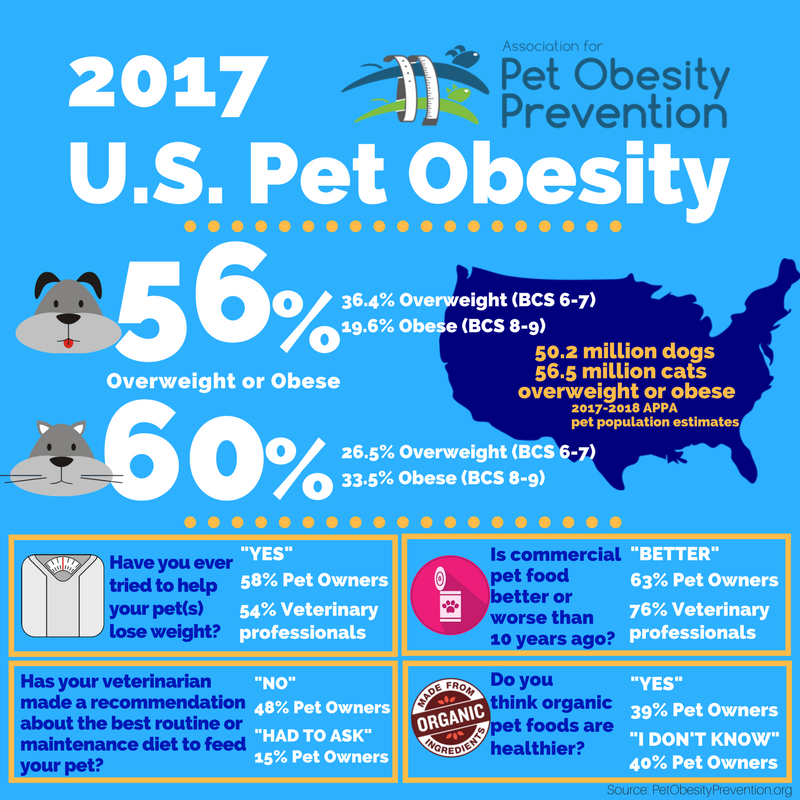 APOP conducts annual research to substantiate pet obesity prevalence levels in the United States and offers resources and tools to veterinarians and pet owners to better equip them to recognize and fight pet obesity. More information about APOP can be found on their website www.PetObesityPrevention.org.